(Nanowerk News) A nanometer-scale probe designed to slip into a cell wall and fuse with it could offer researchers a portal for extended eavesdropping on the inner electrical activity of individual cells. 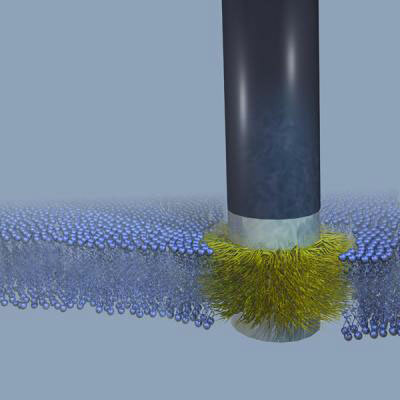 The key to the probe's easy insertion – and the membrane's desire to retain it – is that Melosh and Almquist based its design on a type of protein naturally found in cell walls that acts as a gatekeeper, controlling which molecules are allowed in or out. "Ideally, what you'd like to be able to do is have an access port through the cell membrane that you can put things in or take things out, measure electrical currents … basically full control," said Melosh. "That's really what we've shown – this is a platform upon which you can start building those kinds of devices."